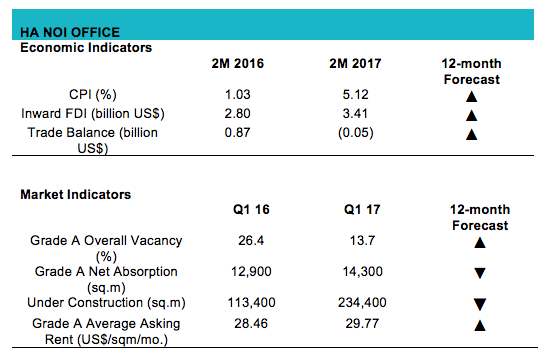 Report notes significant growth in Grade A and Grade B office-for-rent during the first quarter. Hanoi’s office market is expected to have more than 200,000 sq m of new supply completed, of which half will be concentrated in secondary areas, 41 per cent in the west, and only 9 per cent in the CBD, according to Cushman & Wakefield Vietnam (C&W)’s first quarter report on the capital’s office market. One Grade B office building was completed, adding 8,400 sq m to the market. There are now 17 Grade A and 69 Grade B office buildings in the city, providing over 400,000 sq m and 800,000 sq m of space, respectively, to the market. Over 45 per cent of total stock was concentrated in secondary areas (Ba Dinh, Hai Ba Trung, and Dong Da districts), 34 per cent in the west, and 19 per cent in the CBD. Both grades showed improvements in market performance. Grade A occupancy increased 4 percentage points quarter-on-quarter and 13 percentage points year-on-year to 86 per cent. Meanwhile, Grade B office space recorded a modest 1 percentage point increase quarter-on-quarter and 2 percentage points year-on-year, to 91 per cent. Significant absorption was recorded, totaling nearly 30,800 sq m in both grades, up 47 per cent quarter-on-quarter and 65 per cent year-on-year, Grade B outperformed Grade A in the quarter and contributed 54 per cent to total absorption. More than half of total net absorption was recorded in secondary areas while a quarter was attributed to western areas due to reasonable rents. Average rents in both grades continued to trend upwards, with Grade A spaces climbing to VND679,000 ($30) per sq m per month, up 1 per cent quarter-on-quarter and 5 per cent year-on-year, while Grade B spaces remained at VND422,000 ($18.5) per sq m per month, stable quarter-on-quarter and up 2 per cent year-on-year. Competition will be more intensive not only because of upcoming projects but also from the gaining popularity of alternative office spaces such as serviced offices, co-working spaces, and “office-tels”, the report noted. The market is expected to remain tilted in favor of tenants in the short term. “Vacancy rates in both Grade A and Grade B buildings in the CBD are under 10 per cent and have fallen consistently for the last 18 months and we have reached the lowest CBD vacancy rates of 4 per cent in Grade B and 4.6 per cent in Grade A,” said Mr. Alex Crane, General Manager of Cushman & Wakefield Vietnam.